Chris Hand from Leicester Polytechnic offers a delightful history of W Industries, the company who brought us the various Virtuality VR game systems. His history begins in the early 80’s and takes us only to early October of 1991, not long after the commercial introduction of Virtuality’s Series 1000 Amiga based systems. The excerpts below offer a taste of the VR buzz in 1991, but take the time to read the entire history! A video clip from an early 80’s episode of the BBC TV programme “Tomorrow’s World” showed some of the early work of Dr Waldern. The “Roaming Caterpillar” (as it was known) was shown being used by presenter Maggie Philbin to examine a virtual room. The display was a large B/W monitor with handles on each side, supported by a flexible arm on castors covered by a concertina of rubber (the “caterpillar”). The image displayed was a wire-frame view of the “contents” of the (actually empty) room. The location of the monitor was sensed by 3 fixed speakers emitting audible clicks in a fixed sequence, with the time taken to reach microphones being used to calculate the distance. It was also possible to detect the position of the user’s fingers by wearing tubes on them, with microphones and wires attached to a control unit. By pinching her fingers together in the right place, the presenter picked up the receiver of a virtual telephone and left it suspended in space. 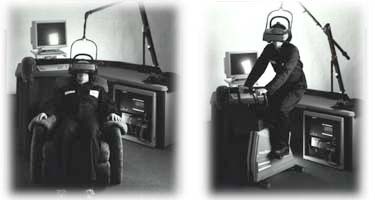 Their second HMD, another tethered system, was known as the “giraffe”. This featured mechanical 2D head-tracking. The fourth device to be built was much slimmer, featuring a magnetic head-tracker and twin LCD screens. It is of interest to note that the head-mounted part of the device allowed for adjustment of inter-occular spacing. At the time it was thought that the correct adjustment of this distance to suit each viewer would be vital to the stereoscopic effect. Mr Rowley pointed out that it was later found not to be so important, as long as the exit pupil of the optics was made large enough. In November 1990 the “Stand-Up” unit was launched at the Computer Graphics 90 exhibition staged at London’s Alexandra Palace. At the same time the parent company went into liquidation, but fortunately W Industries had been sold just prior to this to another company, which also owns the Wembley Stadium in London.